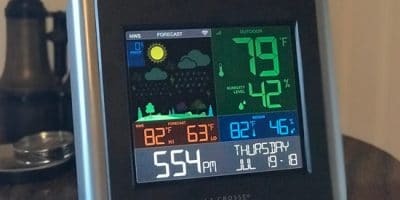 Davis Instruments’ Vantage Pro2 has set the bar high for what home weather stations can be. For over a decade these systems have been the company’s top of the line product, but with that status comes a higher price. However, its dominance is under attack, as a few new high-quality home weather stations have made it onto the market. These stations include features that Davis’ line does not have or you need to pay extra for, putting pressure on the market leader. One of these features is built-in connectivity, which the Vantage Pro2 doesn’t have. Adding internet connectivity costs extra, and is something other stations include. Even so, it’s hard to say no to this station if you can afford it. Sure, you could step down to Davis’ cheaper Vantage Vue system, but as we said in our review of that station, it does have some significant disadvantages compared to the Pro2. 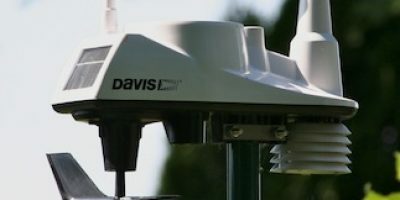 The Davis Vantage Pro2 is the top home weather station on the market by far, with unmatched accuracy and a long record of reliability and durability. 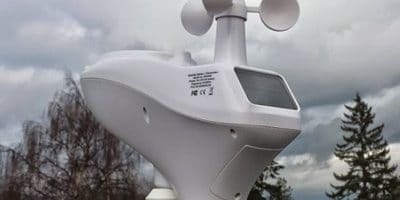 While it is one of the most expensive personal weather stations out there, you’re paying for quality. The only thing we’d change is the inclusion of internet connectivity rather than making it an additional expense. Pro2 vs. Pro2 Plus—Which one should I get? Like the Vantage Vue, the Pro2 is not a ‘plug-and-play’ weather station and will require some time to assemble. We recommend setting aside about 30 minutes and have a mast ready to install the sensors on to. The desktop console also requires a little bit of work to setup, it's cumbersome, but not difficult. If you bought WeatherLinkIP, there are a few extra steps that you'll need to complete depending on which one you've bought. We'll cover that later. We'll remind you of our sensor placement suggestions which can be found in our home weather station buying guide. The Vantage Pro2 doesn’t have an equal in the home weather station market when it comes to accuracy, and reviews from customers and experts alike regularly point to this as one of The Pro2’s most attractive features. With the addition of the fan-aspirated radiation shield that comes with the Pro2 Plus, the already accurate outdoor temperature/humidity sensor should perform even better. You’ll also get updates on conditions every 2.5 seconds. A note on that radiation shielding: the standard Pro2 does have radiation shielding to protect it from direct sunlight—thus resulting in more accurate readings. What it doesn’t have is fan aspiration. What is this? In simplest terms, while direct sunlight is not hitting the sensor, there still is some heat buildup in the closed space. By using fan aspiration in the Pro2, Davis circulates any heat buildup out of the area around the temperature and humidity sensors, resulting in better (and more accurate) readings. 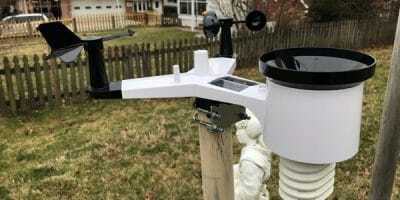 Davis also recently redesigned the rain gauge of the Pro2 to perform better in windy rain events like thunderstorms, tropical storms, and hurricanes. Called the “Aerocone,” the gauge’s shape prevents turbulence around the mouth of the gauge, which can prevent rain from making it into the gauge itself. The anemometer uses the traditional cup and vane, the preferred method among the pros. It’s also separate from the temperature/humidity/rain gauge sensors, which allow for optimum placement for the best accuracy. Remember, the temperature and humidity sensors should be placed at “eye level (5-6 feet), while the wind vane and gauge should be at the height of 33 feet! For us, the upgradability of the Vantage Pro2 is its biggest selling point over its cheaper sibling, the Vantage Vue. The Pro2 allows you to add additional sensors, and which ones you add depends on your needs. Outdoor enthusiasts will find the UV and solar radiation sensors useful, while gardeners might find the soil moisture and leaf wetness sensors helpful. You can add just one, or all four: the Pro2’s great expandability options make that possible. Davis sells four different models of the Pro2: a wired and wireless version of the Pro2, and then a wired and wireless Pro2 Plus. Our base recommendation is the wireless version for the most flexibility in sensor and console placement. With the Pro2 and Pro2 Plus, the main difference is the inclusion of a fan-aspirated radiation shield in the Pro2 Plus model (which we discussed earlier). A UV and a solar radiation sensor are standard in the Plus model. All other features of the Pro2 and Pro2 Plus are the same. We recommend upgrading to the Plus if there is a need for precision measurements, especially when it comes to outdoor temperature and humidity. However, if this is less of an issue for you, the Vantage Pro2 will be more than sufficient. The Pro2 suffers from the same connectivity problems as other Davis stations. It costs quite a bit extra, and the interface itself seems dated. But if you want to import data onto your computer or onto services like Weather Underground, and through apps available for both iOS and Android, you have no choice. There are three different versions: one each for the Windows and Mac OS platforms, and then an Internet-only version that connects directly to your router called WeatherLinkIP. We’d recommend that version (we were sent this one for testing), as both the Windows and Mac versions, require you to have your computer on continuously to upload data to the web. WeatherLinkIP also includes the software (Windows only, though), so if you need the option to download data to your own computer you can do so—although it does require a bit more complicated setup to get the software to work (you’ll need to know the WeatherLinkIP dongle’s IP address). If you don’t need that, then you should have no problem at all getting your data online with WeatherLinkIP. You’ll need a device ID and key that’s on the dongle itself. Start off by removing all power to the desktop console. Once it’s powered down, plug the dongle in and the Ethernet cable to your router. Power your console back on, and you should hear confirmation beeps. Once this happens, all you’ll need to do is register for an account at Weatherlink.com, and once you get set up, that information should be available online. To get your station on Weather Underground, click on My Account, and then Uploads. You’ll have a space to enter the necessary information there. If you’re done, you can click on My Weather to see your data in real time in graphical format, and click around to see some of the other options too. One caveat: If you’re looking for graphs and things, it might be better to use the Weather Underground pages as Davis currently doesn’t provide anything like that. Once your data is online, you can also view it through Davis’ ﻿﻿﻿﻿official ﻿﻿WeatherLink app. If you’ve just installed your station, give it some time to make it to the app: we couldn’t find our station in the apps search function for about an hour or two. What we really like about the Vantage Pro2 is its expandability. We’d especially recommend the Pro2 for gardeners and farmers, as you will have a clear picture of how your farm/garden is doing thanks to those optional sensors. We of course also can’t say enough about the accuracy of the Pro2—but you’ve seen that repeatedly throughout this review. Like the Vantage Vue, our biggest beef is with the lack of built-in connectivity. These stations are not cheap, and having to shell out extra money for the functionality—and on top of that a dated interface—is a little bit frustrating. As we’ve said, the Pro2 is the cream of the crop when it comes to home weather stations. But if you’re still having trouble justifying the cost, step down to the Davis Instruments 6250 Vantage Vue. It’s cheaper and nearly as accurate. You’re losing the expandability of the Pro2, but it’s the closest you will get overall. Otherwise, if you still want a station that offers the ability to separate and extend the anemometer then consider the AcuRite Atlas. Yes, there’s no internet connectivity out of the box, which is quite disappointing given its premium price. But it’s the only flaw that we can point to as a genuine issue. For weather enthusiasts that want professional grade accuracy from home—the Vantage Pro2 is the best option. The Vantage Pro2 is an investment, given the premium you’ll pay over competing models. Parts of the station also feel a bit dated, like they’ve been frozen in time. However, accuracy is key, and the Vantage Pro2 is king.